Two days ago as we were leaving Florida Hospital, Mike asked me what day of the week it was. It’s always so difficult to keep up with the days when you’re out of your routine. When I told him it was Sunday, he said, “Can you believe that one week ago today we didn’t even think this surgery was going to happen and now we’re getting released from the hospital?? ?” Crazy. What’s even wilder is thinking we were in the hospital four days, just one day longer than we were there for me to have a baby, only Mike had someone else’s organ put inside of him. Crazy. I’ll try to sum up our week in fewer than a million words if possible. After an abnormal EKG threatened to cancel the surgery altogether, we were required to get a stress test done last Monday & Tuesday. Tuesday afternoon, the call came. The stress test results were in and surgery was on. When we arrived Wednesday morning, we were told that the results of the stress test were awesome & his heart was in great condition. They began to prep Mike by putting in an IV and starting labs. Then came that word you never, ever want to hear from a medical professional, “Huh.” I’m telling you from experience, that puzzled “huh” is never a good sign. The nurse said his potassium was reading 6.1, too high for surgery. 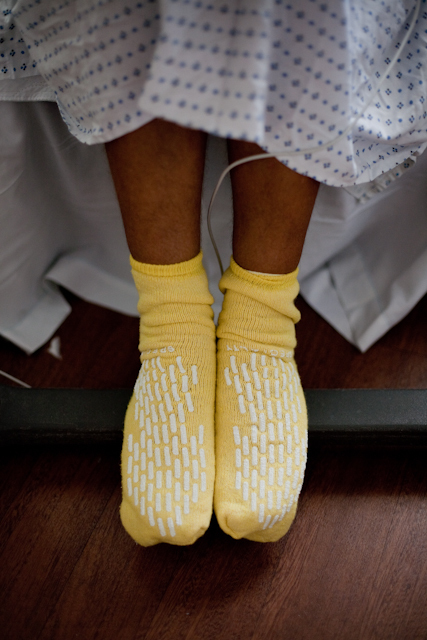 Cue the talks from nurses, anesthesiologists & more. In the next 2 hours, we heard that the surgery was off, that it would maybe be rescheduled for the next day, oh maybe they can do it tonight……so many different answers as everyone tried to scramble & salvage the surgery. After 4 sticks that all came back with his potassium being too high, they just didn’t want to risk putting him under anesthesia with his labs out of whack. Finally, Mike was sent to dialyze in the hospital. Before they began, the nephrologist asked for his blood to be read directly from the machine (a more accurate reading) and it was 5.8, fine for surgery, but since he was there, they put him on the machine for one hour anyways. He walked out with his potassium at 4, which is much safer for surgery, so the four hour delay was worth it after all. It all worked out in the end, but it just goes to show that the surgery was in jeopardy all the way up until the morning of, definitely affirming that my “I’ll believe he’s having surgery when I see them wheel him into the OR” attitude was warranted. The next five hours were difficult. It’s not fun feeling like you’re in the dark just waiting to hear that everything is okay. I’m thankful I had plenty of support. My dad, my best friend, my sister-in-law, my aunts, my in-laws, & of course the Carlisle family. I knew after Tim’s surgeon came out to tell his parents he was fine we would have about 1-2 hours left before I would get to talk to Mike’s surgeon. 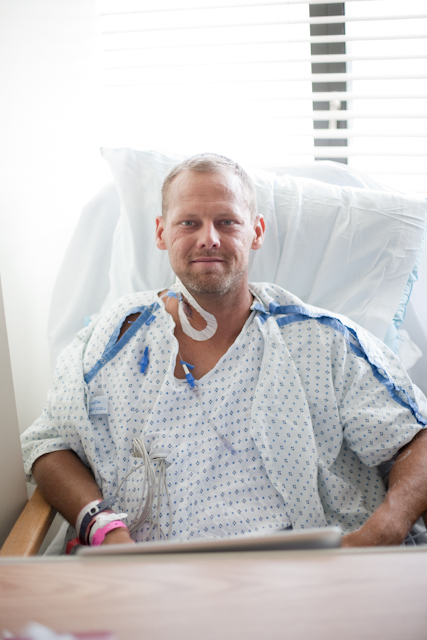 Like I wrote about here, Tim’s surgeon was kind enough to share a few details about Mike, including the awesome news that he witnessed Mike’s new kidney “pink up” almost immediately after being connected to his renal vein & artery. What a relief to see Mike’s surgeon walk in the waiting room. Hearing that man say, “Everything’s great”, allowed me to exhale for the first time in hours. 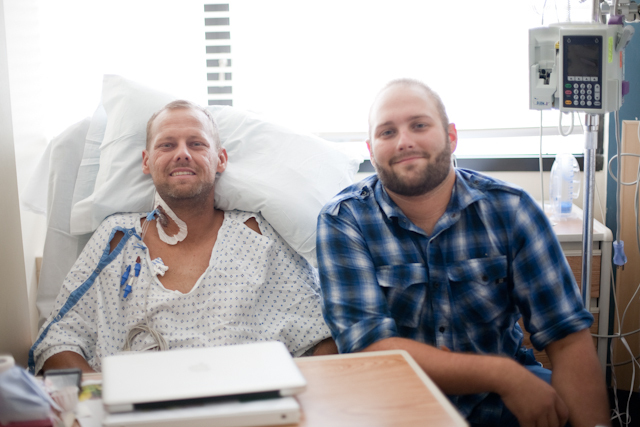 A few hours later, they finally got Mike moved into ICU where I could see him. He was in a pretty significant amount of pain at that point because he hadn’t had his pain pump of morphine for very long. As soon as I got past the difficulty of seeing him in pain, it hit me. His face looked completely different. There was color. Now Mike’s pretty tan (lucky), so it wasn’t as if his skin was literally a different color, but that warm, pink look that comes from inside when your body is healthy. I had somehow managed to make it through the entire day without shedding a tear, but it all came out when I saw him looking a way that he hadn’t looked for years. I managed to choke out the words, “Your face!” Poor Mike and the ICU nurses. They all thought something was wrong as I stood there bawling. “What’s wrong with my face?? ?”, Mike said with obvious concern. The nurses waited for my response nervously. “You look so good. You look healthy. I forgot what you used to look like.” Mike & his caregivers collectively breathed a sigh of relief as they realized my crying was coming from a place of joy. Although he wasn’t saying much because of the pain, right before I had to leave him there in the ICU, he said, “I think I feel good.” I will never forget hearing him say those words & the way he looked that night; somehow stronger & healthier in spite of just undergoing a major surgery. The next morning I walked back into his room to find him smiling. With a face like a kid on Christmas morning, he looked at me & said, “Look at my hands!”, his palms facing out towards me. We both inspected his palms & the soles of his feet. For the first time in years, they were pink instead of gray. I took a picture of him on my cell phone to show him his new look with a face full of color and eyes that were finally white & bright again instead of jaundiced. All of those things pointed to one thing; they were signs that life had returned to his body. He told me that he could hardly sleep the night before, not just because the nurses were in every hour, but because he was just so excited to feel good. The rest of that day was incredibly emotional for both of us. I spent most of the day crying, and he spent most of the day telling me how great he felt & how happy I looked. We have been through so much in the past few years, and at times, it felt like God had somehow overlooked us. But on that day, it was clear that God’s way of healing Mike’s body wasn’t through an instant fix allowing us to avoid the difficult journey, but through very skilled surgeons and an extremely generous friend. I walked through the lobby of the hospital to get some lunch at the cafeteria as the song played above my head on the hospital’s sound system. Our God is greater, Our God is stronger, God you are higher than any other, Our God is Healer, Awesome in power, our God. Later that afternoon came one of the most wonderful moments of the entire experience. One of the nurses from Tim’s floor wheeled him into Mike’s room in the ICU. My husband is one of the kindest, most loving people you will ever meet, but he doesn’t cry. He didn’t cry on our wedding day or when Lincoln was born. It’s just not the way he expresses his emotions. I cry when I see those Publix commercials they play around Christmas time, so it’s difficult for me to understand why he doesn’t cry, but it’s just not him. I guess there’s a first time for everything, because Mike was overwhelmed with emotion as he saw Tim, the guy who was willing to get cut open and face excruciating pain for days just so he could have a new life. The only words he managed to say were, “Thank you”, to which Tim simply replied, “No problem.” I’ve been reading a book called Love Does that talks about the fact that love doesn’t just say things, love does things. Last week we were blessed to experience that kind of love from Tim & his family. Tim, we will never be able to thank you enough. What a gift you have given to us. And to Pat & Joe, as a mom, I don’t take for granted for one second what you two must have gone through watching your baby go into a major surgery that wasn’t even necessary for him, and then watching him experience pain for days. You are all heroes to us and our families. Thank you just doesn’t sound like enough. Finally, I’ll mention a little about Mike’s improvement since the transplant. It has been so wonderful for me to see him looking and acting like his old self. I can’t tell you what that has done for my heart. Besides the obvious ways that he looks different, his labs say that he is truly better. His phosphorous, potassium, creatinine, BUN are all basically that of any normal healthy person. Can you believe that? The very next day after surgery, his labs were fantastic. Even his blood pressure was nearly perfect without any meds for 2 days after surgery. Unfortunately, one of the side effects of the anti-rejections medications he has to take to keep his kidney healthy is high blood pressure, so he is on some blood pressure meds. That was our only disappointment during this whole thing, but the good news is, he’s on much smaller doses now than he was before surgery. Before surgery, he took nearly 1,000 mg of BP meds each day and that didn’t even fully control his pressure! It was still high every time we read it. Since surgery, he’s only on about 600 mg and every time we take his pressure, it’s great. It’s such a relief to see normal numbers when we take his blood pressure & get his labs back. There’s always the chance that Mike’s body could reject the kidney or that he could have some serious side effects from the immunosuppressants he has to take for the rest of his life. Thankfully the team at the hospital told us that he has an incredibly low chance of rejection based on the great kidney he got and lots of other factors that worked in his favor. As far as drug side effects, it is scary to be on medications long term, but the benefits Mike has felt already have made us confident that we made the right decision to proceed with a transplant. Mike will be monitored very closely for the next 3 months to make sure his body isn’t trying to reject the kidney. After that, he will be checked routinely to not only see the condition of the organ, but also to make sure he isn’t experiencing any problems from the immunosuppressants. 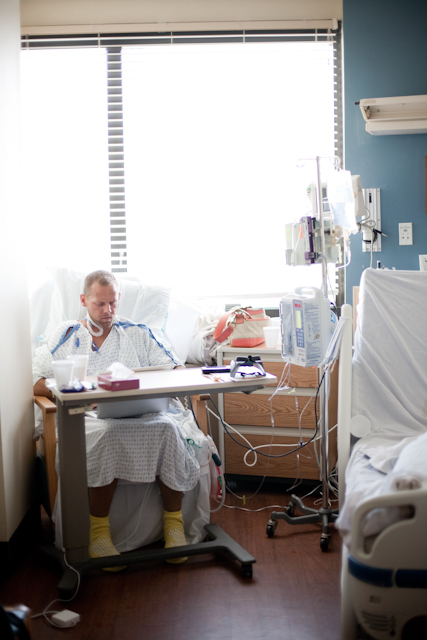 While we were in the hospital, I remembered a conversation I had with the wife of a man who received a transplant more than 20 years ago. She told me that even though they tell you a transplant isn’t a cure for kidney disease, it sure feels like one. I couldn’t agree more. We are thankful to be home where Mike can continue his recovery in a little more comfort than you can get in a hospital bed. Thank you for your prayers and kind words. I can’t even count the number of texts, emails, calls & Facebook messages we received last week. We truly felt the love and it meant so much to us. Entertaining himself on his laptop. Gotta love those fancy socks they give you. 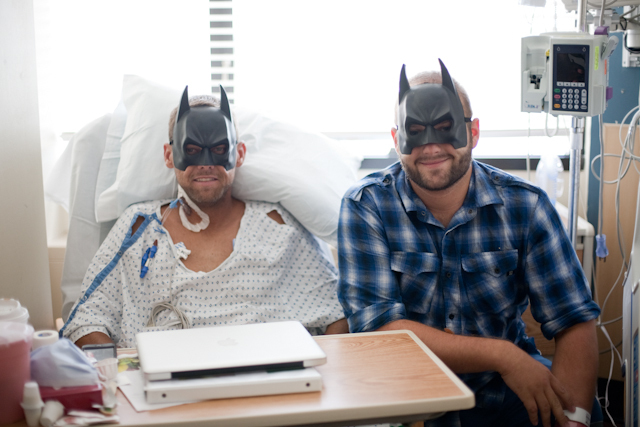 Mike & Tim were disappointed that they couldn’t go see Batman this weekend. This was their consolation prize that Joe & Pat brought to the hospital for them. Indulging me for one photo together. So many emotions ran through my body reading this blog! I am so so so happy that everything went well through both surgeries and that Mike is feeling good! The pictures definitely show a new glow about him! Will be continuing to keep you guys and Tim’s family in prayer. Looking forward to gettin to see you guys! Wow…..I was in tears reading this, just thinking how awesome God is and so over joyed for you and Mike! We truly love you guys and you haven’t left my thoughts or prayers since I heard about Mikes kidney a few years ago! Much love to you two!!! Wow!! I was in tears as I read!! And then came the pics!! He looks amazing!! We love you all sooo much and are thrilled that he is doing so well!! Tim is an awesome person and friend who truly shows love in action! LOVE your updating all of us who care so much about Mike. He looks FANTASTIC!!! The last few inspections he’s done for me, I didn’t say anything, but I’d leave so worried about him – he looked AWFUL – so gray!!! And now, look at him – looks like the very picture of good health!!! God is SO good! Thanks for sharing the “inside” story – Hugs to Mike and bless you for keeping us all updated! What a joy to read!! And even in the pictures, I can see the healthy look about Mike now. I’m elated for both of you…and for your little boy who will have a healthy dad now. Thank you for sharing so beautifully what your life has been over the past week and years. I pray for health and wholeness for Mike and his new kidney, that God will protect it and it will continue to perform at optimum capacity FOREVER! Thank you for the pictures, too. Tim and Mike both look very happy and healthy. God bless you all! This is the best post I’ve ever read on your blog.